The Tull Family Theater and Quantum Theatre are collaborating for a special screening of a period murder-mystery, The Limehouse Golem, on Monday, Aug. 27, at 7:30 p.m.
Come as early as 7 p.m. to chat over a complimentary glass of wine with Karla Boos, Quantum Theatre’s founder and artistic director, and members of the Quantum team. You can solve the first mystery of the evening: how the night’s special screening connects with Quantum’s upcoming play Chatterton, premiering Friday, Sept. 14, as part of the Pittsburgh International Festival of Firsts. 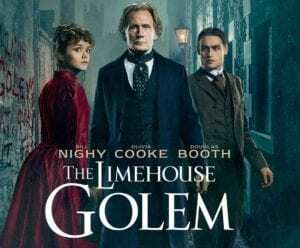 Boos will introduce The Limehouse Golem at The Tull Family Theater, with a special tie-in to the Quantum’s season. In the film, Bill Nighy stars as a Scotland Yard inspector coming to the close of his career in Victorian England. Murder—perhaps a serial murder—impacts London, specifically the troupe at a seamy music hall. “With this special screening, two art-driven organizations present the opportunity for their patron bases to enjoy a cross-cultural event,” says Carolina Pais-Barreto Thor, executive director of The Tull Family Theater. To join the two organizations for their inaugural collaborative event, purchase tickets online under the Advance Sales tab at www.thetullfamilytheater.org. General admission is $11, with discounts to $8.75 provided to seniors 65 and older, college students and military with IDs, and groups of 10 or more.